I love giving away rabbit jerky for one simple reason. Emma, the GBGV, loves rabbit. I always root for her to win. She never does. And I’m not allowed to rig contests, so she’ll just have to enter multiple times via Rafflecopter. Tweeting the giveaway daily is a great way to up the odds for a win. I sure hope I didn’t jinx Emma’s chances by saying all of that out loud. Rabbit Entree’ Jerky is a great treat for ringing in the new year. Rabbit is a clean, healthy meat. One could say that it’s nature’s way of feeding the planet protein, as quickly as rabbit’s reproduce. They’re easy prey, great for the food chain. And great for dogs. My own dogs aren’t fast enough to catch the million rabbits inhabiting our back yard, so I have to give them Jones Rabbit Entree’ Jerky to keep them happy. 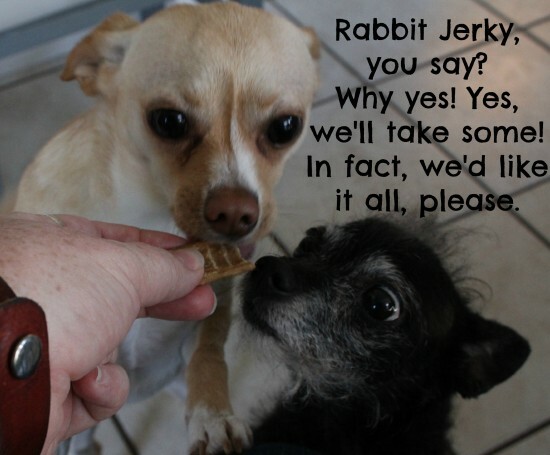 I also happened to be at a friend’s house and have some rabbit jerky in my purse, while she happened to have two adorable dogs looking for treats. Say hello to Keira and Glory. Another instance of taking plenty of photos, only to come home with lots of blurry ones. These two cutie pies couldn’t get enough of the Rabbit Entree’ Jerky, but they’re both tiny dogs, so I hesitated to give them much, maybe a stick apiece, broken into pieces and doled out over twenty minutes. Maybe. By then they knew I was in the treat business and wouldn’t sit still. In fact. Miss Keira was pretty demanding. 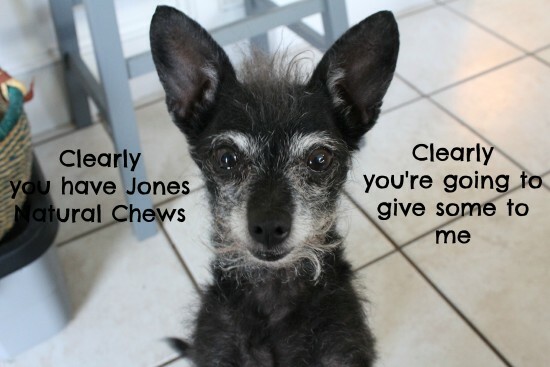 So what does Jones Natural Chews have to say about the Rabbit Entree’ Jerky? For sure they only have three ingredients – rabbit, rye flour and salt. 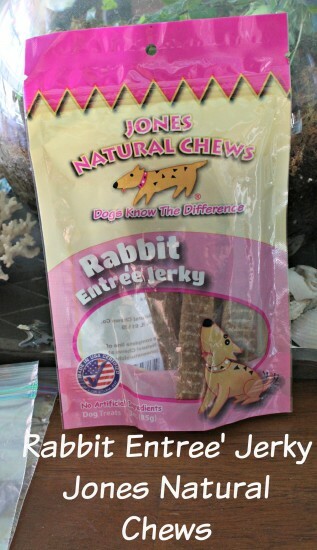 Jones’ Rabbit Entrée Jerky is a great treat for dogs with or without allergies. It offers a different protein source made of USA all-natural rabbit and is naturally baked. This unique treat does not have artificial ingredients added. It breaks up easily for training and is great for all size dogs. All Jones’ products are 100% grown and made in the USA. In other words, if you’re looking for a treat that even dogs with sensitive tummies can handle, the Rabbit Entree’ Jerky is your treat. And it’s perfect for dogs of any size. In fact, if you and your dog compete in any way (rally, agility, fly ball, etc. ), they’re easy enough to snap into small pieces and keep in a bag as a motivator. How do you enter? First, the limitations. Yeah. That’s it. Now enter! The Rafflecopter will tell you the rest.